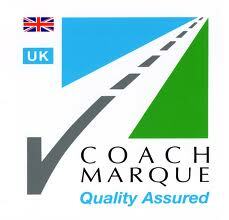 CoachMarque is the only universally recognised kite mark of quality in the UK coach industry. It is concerned with all aspects of the business and not just the vehicles themselves. All CoachMarque companies operate to a strict set of criteria and are regularly assessed by an independent third party to ensure compliance with the highest standards of operation. Coastal Coaches of Warton are proud to announce that we have passed another stringent, independent audit with flying colours, And all of our coaches carry the accreditation. * And remember, only 49 UK coach operators, and only six in in the North-West of England, have qualified for CoachMarque. Since October 2013 Coastal Coaches have been licensed members of BUSK, an organisation that promotes safe child road transport throughout the UK. (BUSK License no BE0078). The following text is advice from BUSK for teachers. • The standard and type of transport used. to comply with Drivers’ Hours Regulations). • Route to be travelled. • Forward planning including emergency plans in the event of breakdown, accident or illness. SCHOOLS MAY CONTACT BUSK FOR FREE HELP AND ADVICE ON HOW TO PRODUCE A TRANSPORT/SEAT BELT POLICY. MORE INFORMATION ABOUT THE REQUIREMENTS OF SCHOOLS WHEN ORGANISING SCHOOL TRIPS AND VISITS ABROAD CAN BE FOUND AT WWW.BUSK-UK.CO.UK. We at Coastal Coaches are happy to answer any questions you may have.